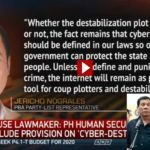 Bongbong Marcos recently filed the motion for reconsideration after the PET allowed Robredo to have copies of decrypted ballots. These are from the secured digital (SD) cards of Camarines Sur, Iloilo and Negros Oriental. VP Leni Robredo’s lawyer, Romulo Macalintal calls this “unnecessary.” He added that if Marcos really wants to get a speedy resolution of his electoral protest, he should refrain from doing so. However, professionalism dictates that if something is not agreeable, a motion must be filed for the record. Abuses of the law can then be very clear in the end. Media stunts come and go but official records stay. 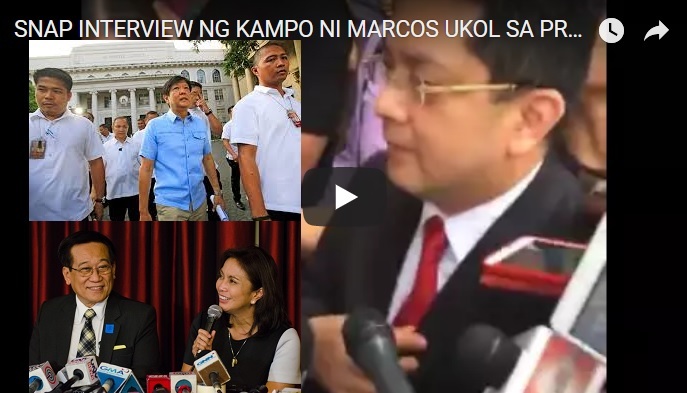 [VIDEO]: In this video clip, Bongbong Marcos’ lawyer, Atty. George Garcia laid out how they can prove a one million voting discrepancy generated by PCOS machines. “By doing this, they have no one to blame but themselves for any delay,” Romulo Macalintal said. The lawyer refers to the partial motion for reconsideration filed by Marcos. He questions the decision dated Nov. 7, 2017, of the Supreme Court that sits as the Presidential Electoral Tribunal or PET. “Like in any other case, both camps are given copies of all documents. 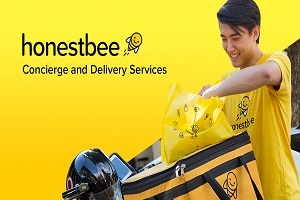 This is the standard practice in the spirit of transparency and fairness,” Macalintal said. He explains that the soft copies can help both parties protect their rights. Marcos earlier questions such explanation because if Robredo’s Camp really believe in it, why did they block it and not help pay for the process? The PET approves the urgent ex-parte motion filed by Robredo’s camp last Oct. 23. That she be furnished soft copies of the ballot images and reports in a decrypted format from the three pilot provinces of Marcos for his election protest. This despite the latter’s disagreement. Meanwhile, Atty. George Garcia of the Marcos Camp can only shake his head on the many cases of abuse done by its rival Camp. 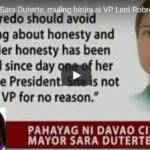 First, Robredo expressed her fear that Marcos might steal her seat. Demonizing him once more using his father’s black media propaganda initiated by her party. Second, she has not paid fully for her counter-protest against Marcos but SC tolerates her so far. Lastly, but not the least or limited to it, she has the most motions filed dubbed as a dilatory tactic to drag the protest further. 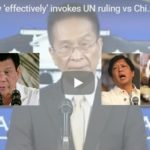 Macalintal is obviously just passing the blame on to Marcos. Bongbong Marcos’ lawyer George Garcia said that the Comelec should start to conduct a bidding process for the next election in 2019 already for suppliers of automated election machines. 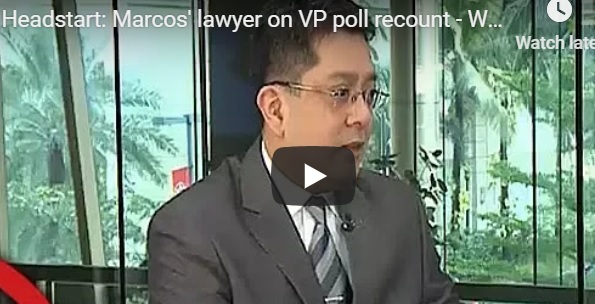 He adds that the result of Marcos’ electoral protest against Leni Robredo can even help in determining if there are no revisions to the actual vote counts compared to the machine-generated results. Atty. Romulo Macalintal of Robredo’s is obviously uncomfortable upon hearing this. 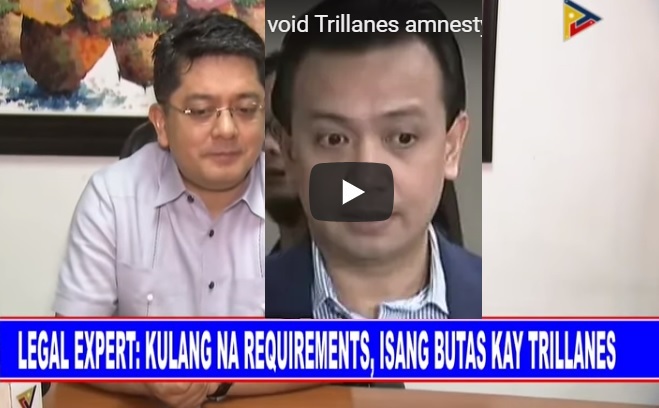 [VIDEO]: VP Leni Robredo’s lead counsel, Atty. Romulo Macalintal frowns when Atty. George Garcia of the Marcos Camp calls for an early automated election bidding process. This is for Comelec to decide if a Smartmatic replacement is necessary. The early resolution of the Marcos-Robredo election protest can affirm the credibility of Comelec and even Smartmatic if Robredo wins. If it is the other way around, then it’s about time to change the supplier. Garcia stresses that it’s better to look for options already early on so that decisions won’t be last minute. That can end up in selecting only the available choice and not the best if Comelec won’t move now. Marcos may want to win the protest but if it won’t work in his favor, it’s also acceptable. What’s important is to expedite the recount to know the real score. Comelec should take advantage of having this opportunity to clear their name from doubts that they have a hand in the alleged fraudulent 2016 elections. 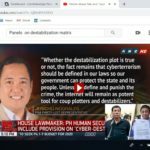 Macalintal mocks the IT experts who give their expert opinions on the transmission trend and server behavior when the immediate twist of fate started on the night of the May 16, 2016, VP race. This is in contrast with Clean Elections advocate, Atty. Glenn Chong’s statement that says that the fraudulent activities during the latest national elections were not only manual but digital in nature. Aside from being a lawyer, he also has some IT background. Not to mention the witnesses of Pastor Boy Saycon in the Senate on the alleged rigging incidents involving system redirecting for questionable servers. The PET ordered the initial recount of votes in Camarines Sur, Iloilo, and Negros Oriental first. This is to prove whether or not the rest of Marcos’ protest has merit. Bongbong Marcos said that it is about to start in November and is expected to be completed in December this year. 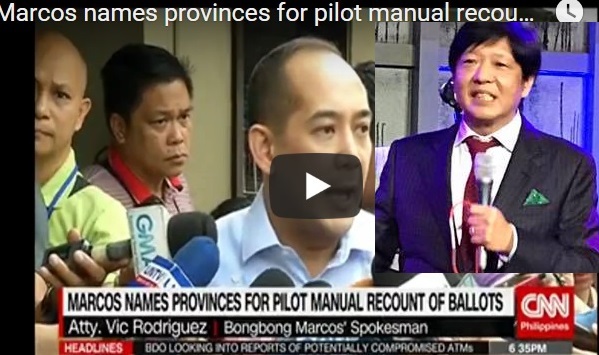 [VIDEO]: Marcos names provinces for pilot manual recount of ballots. Marcos’ lawyer George Garcia told the Supreme Court that Marcos will no longer present witnesses. This is for the annulment part of his petition. It’s because their allegations of electoral fraud can best be proven through a ballot recount. Their camp no longer plans to present testimonial evidence or witnesses to support his allegations of widespread cheating. Particularly in 3 provinces where Vice President Leni Robredo won. Atty. Garcia clarifies that; “The waiver of testimonial evidence in so far as the 3rd cause of action is concerned is not an abandonment of the electoral frauds, anomalies, and irregularities alleged in the electoral protest. These may be proven by the ballots which are ‘the best repository of the sovereign will,'” Garcia added. He also explained that the “unaccounted votes” for the position of vice president can be verified through the judicial and manual recount. This goes with the revision of election paraphernalia in 36,465 clustered precincts under 27 provinces and 5 highly urbanized cities as well.